Me and Ben recently spent a few stunning days by the sea in the beautiful coastal town of Weymouth. We stayed in an adorable caravan but spent most of the time exploring Weymouth and sampling a plethora of local treats and delicacies. The rain was shockingly bad but we didn’t let it stop us; luckily, when the rain came down, we were never far from a pub! We ate in a lot of lovely places over the long weekend but for me, the standout meal was our dinner at Floods Restaurant. This is the number 1 restaurant in Weymouth according to Tripadvisor, high praise indeed! We tried to eat there on our first night but were told they were fully booked all that night and the next! Panic! I asked if we could possibly get a table for Sunday and we were able to snag an 8pm reservation. Success. I was so looking forward to it. I absolutely love seafood and seldom get the chance to sample anything near as fresh as I anticipated Floods would serve. We arrived for our 8pm reservation and were shown to a lovely table for 2. The restaurant was very small with dim lighting and hushed murmurs from our fellow diners. We found it cosy and romantic, perfect for couples. There was a blackboard on the wall crammed with different options all based on that day’s fresh catches which we thought was a lovely touch. Although it did make it harder for me to pick what I wanted as some of the specials sounded amazing too! 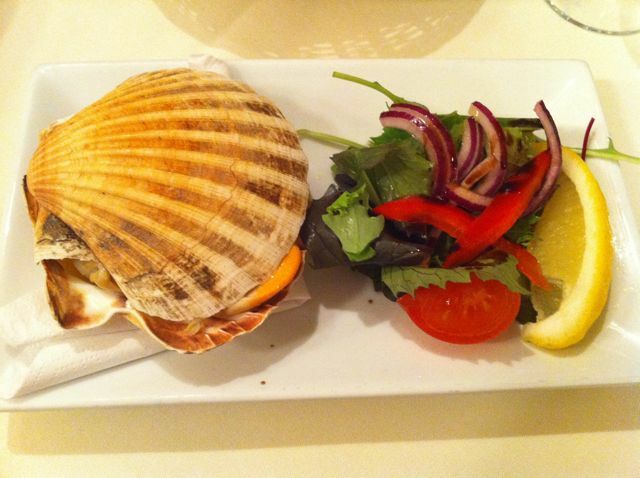 I was delighted to see scallops offered on both the starter and main menus and quickly made the decision to indulge in my favourite food twice in one meal. Ben was also happy to see that there were a couple of veggie options for his starter and he was looking forward to the vegetarian main course of mushroom stroganoff – I had phoned up beforehand to enquire about the evenings offering as the online menu doesn’t specify. 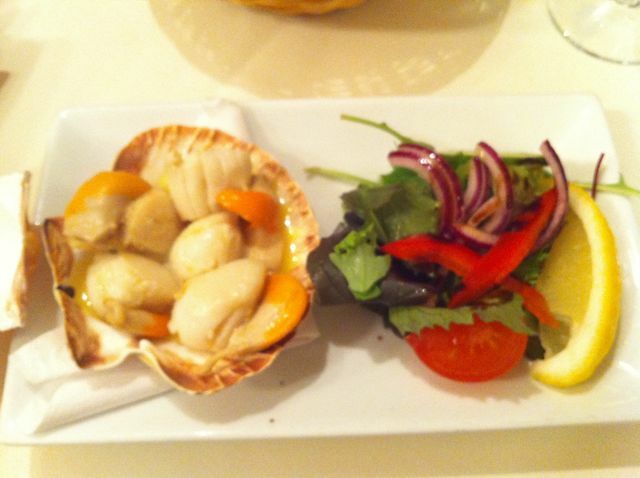 For my starter, I chose the pan fried scallops, cooked in butter, garlic and white wine. The dream! After I had removed the shell (love that presentation!) I was left with this. 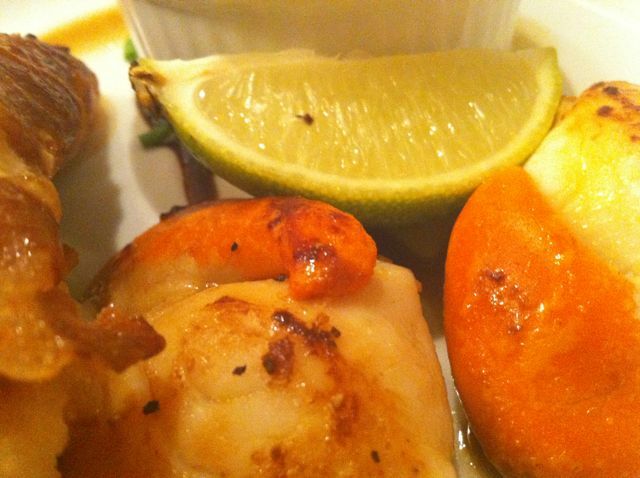 The scallops were huge, tender and melt-in-the-mouth. I was wary of the coral having only ever had supermarket bought, coral-free scallops, but they were a delicious addition. The garlic butter was amazing and I made sure to soak up all the remaining juice with the fresh bread rolls we were served. I was in absolute heaven with this dish! I was gutted when I’d finished but I knew I had even more to come in my main dish! 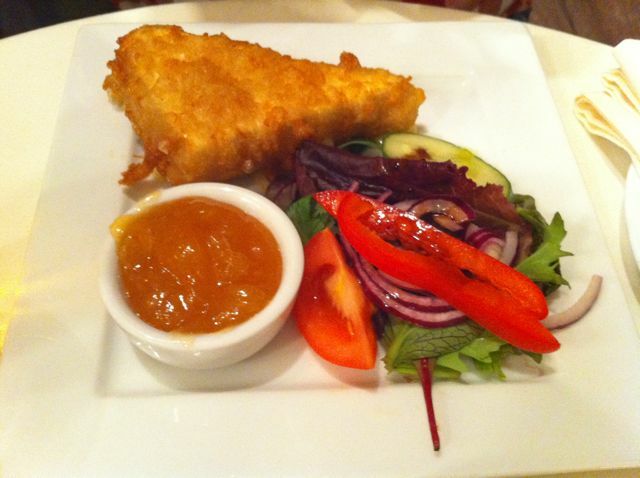 Ben chose ale battered brie as his starter and was thrilled with the generous portion he recieved. The brie was a creamy liquid inside the batter, oozing out teasingly when disturbed with his knife. It was served with a spicy homemade chutney, spicy and tangy, pairing perfectly with the creamy cheese. 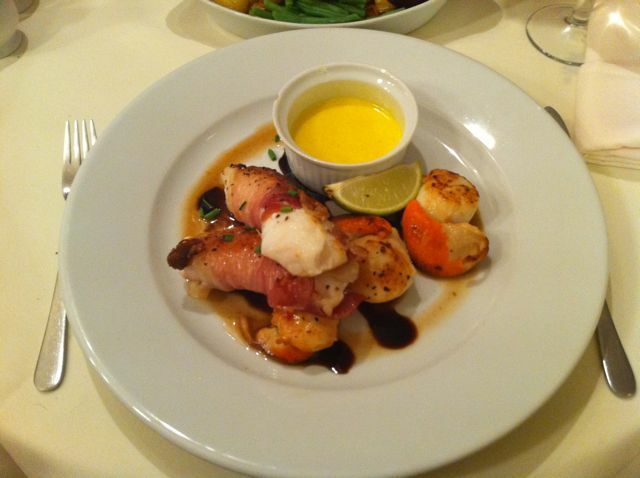 For my main course I chose the monkfish wrapped in parma ham which came with even more scallops, balsamic glaze and a creamy, fragrant sauce. This was an amazing dish. 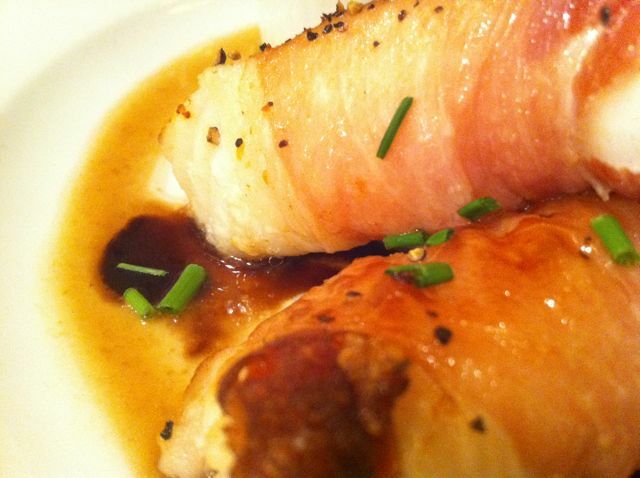 The parma ham infused the delicate monkfish with a lovely smokiness and the fish itself was cooked perfectly, flaking off underneath the ham with the gentlest nudge of my fork. The scallops were once again served with the coral and were as delicious as the ones in my starter and the balsamic glaze was sweet, sticky and thick, just the way a glaze should be! We were served assorted spring vegetables and potatoes with our main courses and I particularly enjoyed the tiny roasted new spuds dipped in the glaze. This was a wonderful dish and has really made me want to start ordering fish and seafood more often when at restaurants. Normally I’m a steak girl but I need to remember how enjoyable and light fish can be. When Ben was served his main course he was initially a bit put off by the presentation. 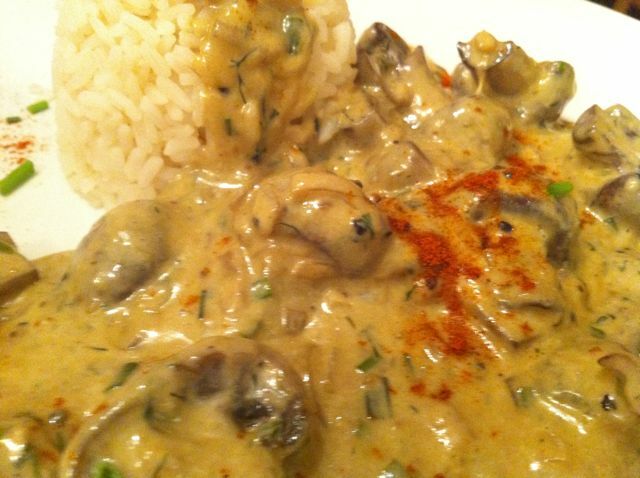 I protested – how nice can mushroom stroganoff ever really look!? And we agreed they’d made a good effort with the shaped rice and sprinkle of paprika. He said it was absolutely delicious though and ate every last bite so I’m glad to report the appearance didn’t put him off too much! 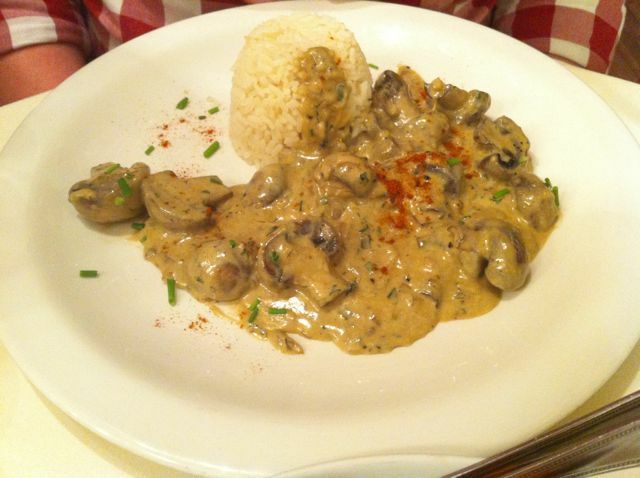 The sauce was rich and creamy with a strong earthy flavour from the mushrooms. We weren’t sure if the vegetables and potatoes went too well with a dish like this but he took some anyway! Predictably, we were too full for dessert but they had 1 or 2 options I would loved to have tried, namely the chocolate pudding! And Ben wanted to try the lemon tart. We’ll just have to go back to sample them!